At 2.00 pm on Monday 16 January 1928, there took place simultaneously the two funerals of Thomas Hardy, O.M., poet and novelist. His brother Henry and sister Kate, and his second wife Florence, had supposed that he would be buried in Stinsford, close to his parents, and beneath the tombstone he had himself designed for his first wife, Emma, leaving space for his own name to be added. But within hours of his death on 11 January, Sydney Cockerell and James Barrie had established themselves at his home at Max Gate, and determined that he should be laid in Poets’ Corner in Westminster Abbey. Trapped between family pieties and what the men of letters bullyingly assured her were the claims of ‘the nation’, the exhausted Florence agreed to a compromise as grotesque as anything in Hardy’s fiction: his ashes were be buried in the Abbey, together with a spadeful of Dorset earth, and his heart in Stinsford churchyard. Dorchester is famously Hardy’s ‘Casterbridge’, at the centre of Wessex, and many a biographer has remarked that his heart rightly belongs there. Yet when Hardy began writing, he had no reason to suppose that for more than fifty years his imagination would linger in the southwestern counties of England. Rather than a calculated first step, as he later liked to suggest, the name ‘Wessex’ was introduced casually in Far from the Madding Crowd, in a description of Greenhill Fair as ‘the Nijni Novgorod of Wessex’, when most readers must have been struck as much by the reference to Nijni Novgorod as by the disinterment of the ancient name of Wessex. In a miniature way the sentence is revealing about Hardy’s position as a regional writer. In describing the sheep fair, on ‘the busiest, merriest, noisiest day of the whole statute number’, the narrator associates himself not only with its regular visitors but also with those outsiders for whom Greenhill and Nijni Novgorod, since 1817 the site of the annual Makaryev Fair, are equally places to read about rather than to visit. He is at once a participant in local life and custom, and an educated observer of it. Perhaps it is only just that the town has a slightly uneasy relation with Hardy and his legacy. It is at least a profitable one. Tourists began using his fiction as a guide to the area as early as the 1890s, and Hardy was canny enough to identify his work with the Wessex ‘brand’; his first volume of short stories was titled Wessex Tales, his first collection of verse Wessex Poems. ‘Wessex’ was not only what he knew; it was what he brought to the literary market-place. The brand remains: contemporary visitors can stay at the Wessex Royale hotel, travel by Wessex taxis, or have their used cars broken up by Wessex Metals. But the visitor who asks in the town centre for directions to Max Gate, or to Hardy’s birthplace at Higher Bockhampton, is likely to ask in vain. When in 1999 Prince Edward was created Earl of Wessex (an earldom defunct since the eleventh century), it was the film Shakespeare in Love, not Hardy’s work, which suggested the title. Divided in life, then, as divided in death? The trope is obviously tempting. Hardy’s fiction is full of characters caught between two ways of life, of natives who return to find that rather than ‘native’ they have become harbingers of a wider and typically newer way of life. But the simple metaphor of division does less than justice to Hardy’s constant negotiation with the class stratification of Victorian society. Part of what Hardy took from his Wessex background, and his family ties, was the strength and will to leave, but the struggle to return imaginatively, and to recreate a past informed by the sense of its own passing, marks all his fiction and most of his verse. It is not division for which Hardy should be remembered, still less in lazy terms of a ‘snob’ trying to disown his roots, or a ‘self-educated peasant’ who could never disguise them, but the search for connection, between social groups, modes of speech, aspiration and memory, the complex sense of participancy and the still more complex right of individuals to be themselves. If the double funerals have an element of the grotesque, easily attached to the marginalising adjective ‘Hardyan’, his achievement as a poet and novelist makes him central to the ‘great tradition’ of English writing. Phillip Mallett teaches English Literature at the University of St Andrews. He is editor of the Thomas Hardy Journal and Vice-Preseident of both the Thomas Hardy Society and the Thomas Hardy Association. 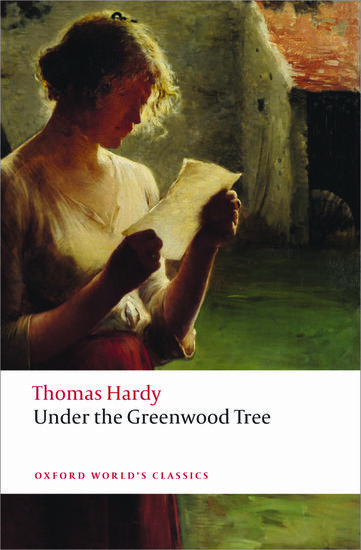 His edition of Hardy’s Under the Greenwood Tree for Oxford World’s Classics is forthcoming in May 2013. Image credit: Thomas Hardy’s Grave by Caroline Tandy [CC-BY-SA-2.0], via Wikimedia Commons. Isn’t it odd to think that Scott Fitzgerald was in Paris in 1928. Somehow Hardy seems to belong so much further in the past.